We’ve been seeing a spur of interest for outsourcing to Belarus among our clients, both for setting up a dev center or making outsourcing partnerships with vendors. We explain this trend by the fact that the Belarusian IT industry is getting out of the shade thanks to several success stories from MSQRD (bought by Facebook), Epam (traded on NYSE), Viber (acquired by Rakuten), Apalon (bought by IAC). Read more in our post Belarus on the leading IT radars. Traditionally, they compare rates in Eastern Europe to India, the Philippines, and other low-cost destinations. We won’t be dwelling on that too much, but there’re not that many mid-sized outsourcing companies in India to whom one could entrust to build the architecture of a complex solution. I have a curious observation from conversations with CEOs of Eastern European outsourcing companies. Customers who had previously worked with India are the biggest hit for them. In fact, these clients already had experience with outsourcing, they were dissatisfied with the quality and/or communication problems. As a result, they really value the relationship with the new partner, tend to have very high level of satisfaction, and become loyal customers and often refer their friends. Customers from the US, UK, Netherlands, Denmark, Sweden, etc. expect that the wages of software engineers are aligned with the cost of living in these locations, which is at least two times lower than in their home countries. But developers’ salaries don’t follow this common logic simply because their skills are highly liquid on the global scale, regardless of citizenship. This is the reason why the standard of living of a developer in Belarus is higher than in Germany, for example. In fact, IT recruiters admit that it became really hard to find Belarusian candidates for relocation to Western Europe, as in terms of pay by PPP they even lose in income. In non-crisis years the wages of software engineers in Belarus are growing by 10-15% yoy. In 2015 they rose only by 2-3% (reasons explained in GoalEurope’s report on IT industry in Belarus). 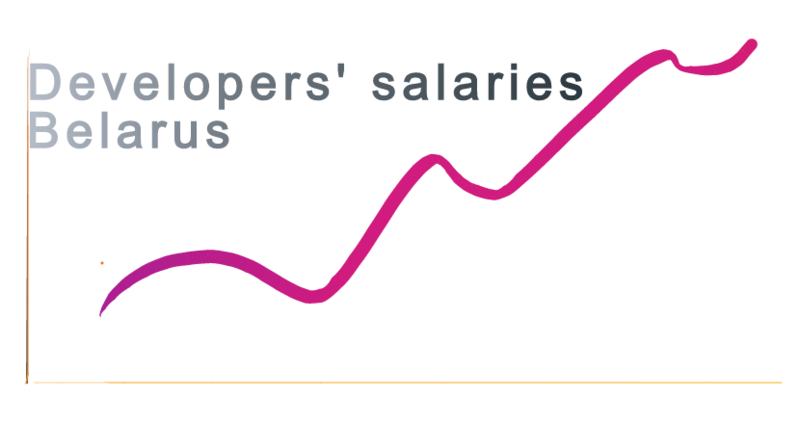 Senior and middle-level developers saw their wages increase by $200-$300 in the past few years. Moreover, in the past year or two we’ve been observing a trend of counter-offers from current employers. Epam, the largest outsourcing company in Eastern Europe, is especially aggressive in using these tactics. Let’s say a mid-Java developer gaining $1,500 announces to his current employer that he has a $1,750/month job offer from a new company. The reaction of the boss? To offer $2,000. These kinds of undercurrents make salary stats not quite credible. But in order to give you a rough idea about IT wages in Belarus, I’d say expect to pay a Senior Java developer north of $3,000, the same with Scala, and $4,000 to $6,000 a system architect. Get in touch with us if you’re looking for trusted software developers vendors from Belarus or other CEE countries, or of you’re considering to open a captive center there.